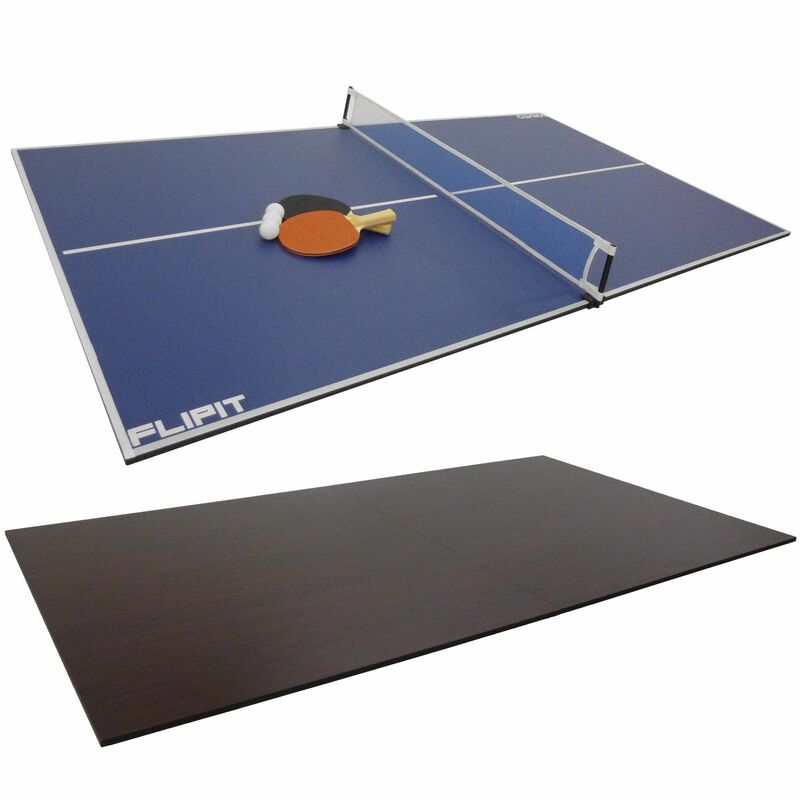 The Viavito Flipit 6ft table tennis top lets you turn your dining table into a table tennis table in a matter of seconds. This high-quality table top is reversible, with a 6ft table tennis top with a blue finish on one side and a stylish dining table with a brown wood grain finish on the other. This is a superb addition to any 6ft games table and will rest conveniently on top of any flat surface. The indoor table top is supplied with a full accessory kit to get you playing straight away that includes 2 bats, 3 balls, a net and posts. 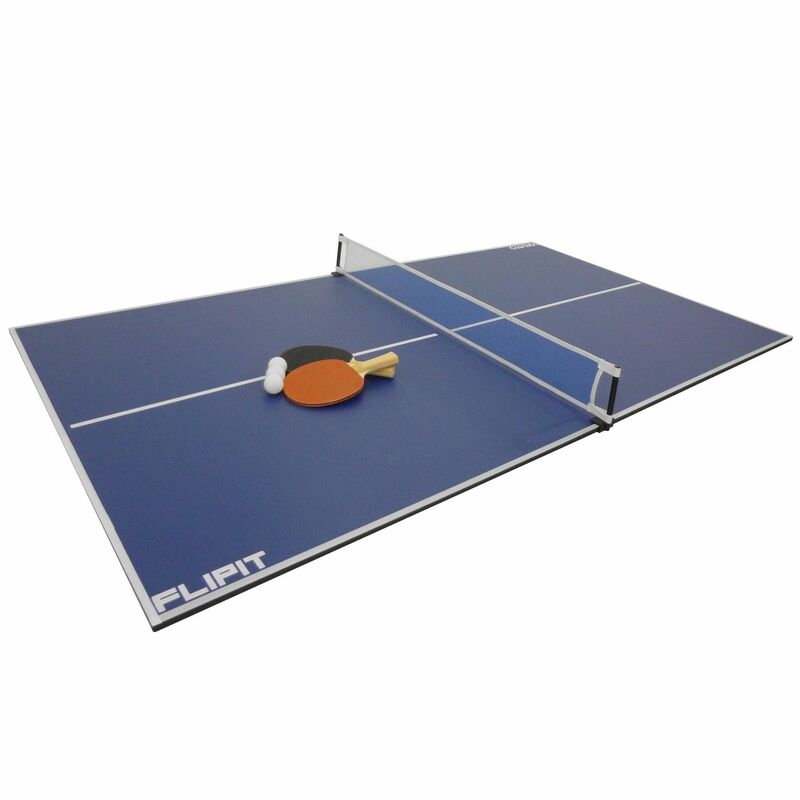 On the table tennis side of this practical and durable top there are markings to define the playing area, and it can be stored easily and efficiently as two separate flat pieces after use. for submitting product information about Viavito Flipit 6ft Table Tennis Top We aim to answer all questions within 2-3 days. for submitting product information about Viavito Flipit 6ft Table Tennis Top. We aim to answer all questions within 2-3 days. If you provided your name and email address, we will email you as soon as the answer is published. Hi. No, the Flipit is an indoor table top. Will it work ok with the 5 foot pool table? Yes you can place it on a 5ft pool table no problem. Setting it up is a simple as inserting the 3 metal dowels into the end of one side and sliding the two table top parts together. To store it away just slide the tops apart. Do I need to attach it to my table? No, the Flipit doesn’t need attaching, it sits stably on top of your table. Yes, the Flipit comes in two pieces which slot together and then come apart so you can store it more conveniently. 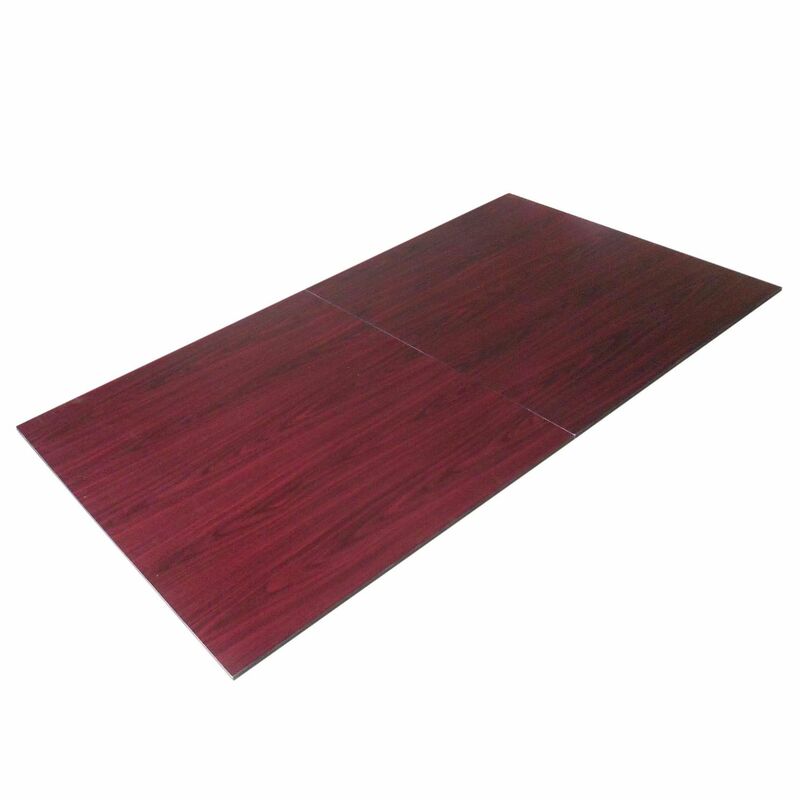 If my dining table is slightly smaller or oval shaped, will the board sit flat on top i.e. Can it sit flat without being supported at the edges? Yes, there's no problem using this with a slightly smaller table or an oval shaped on. The Flipit can hang over the edges of your table. 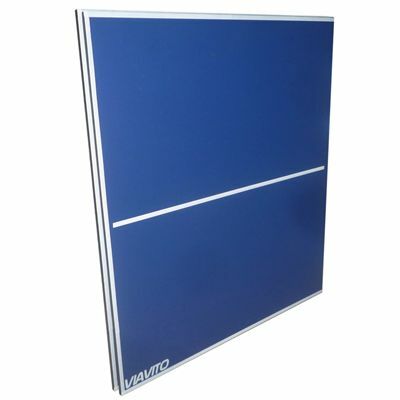 How wide is the viavito flipit 6ft table tennis top and is it suitable for adults? The dimensions are: length=183 cm, width=91.5 cm and height=1.27 cm. And yes, adults and children alike can play using this table. This has been a big hit in our house with all the family ! They love it . It's in constant use . Very sturdy product fits perfectly on top of our pool table with plenty of room . Great size table for indoor family fun. Quality seems fine, we did buy better bats/balls but the ones that came with it are ideal for the kids to learn and practice. Happy with my choice to buy this product. It arrived so quickly, so we'll packed, and great customer service. It is in perfect condition and is really really great!!! This is excellent!.... so easy to put up and put away, my kids love it.... still have it out on the dining table .... worth every penny !!. Easy to use, light and good quality. Brilliant - Easy to set up and store. We use it on the dining room table - Great fun! Our grandchildren were starting to play table Tennis and we wanted both to encourage them, and to play along with them. We did not have space for a full indoor table and did not want an outdoor one so this was a great alternative. Although not full sized it provides a great game and because it can be split down for storage it is very practical. We are very pleased with it. Brilliant quality great value for money. No problem recommending this product, service was great too. Excellent packaging and arrived very quickly. We are all having a lot of fun with it. Great portable table tennis table. Fits perfectly on my dining table and splits in two so stores easily behind sofa. Great table many hours fun, beware it can become addictive and very competative. Great table which is easy to put in place and very good fun to play on. I haven't used the supplied bats and net as I'm using my own. The only negative is that the surface was delaminating on the corners from brand new. I've stuck a piece of tape over each corner to stop it from getting worse. The table has already been used a lot and is great fun - much better than playing on a dining table! It is good and suits us well. The table tennis bats are not the best quality as a piece of wood fell off one of ours after 3 days play. We love this! Its a bit fiddly to set up initially but we have had loads of fun with it and its easy to take down when we need our table back. 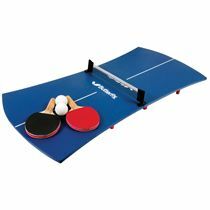 This is a fabulous product and is EXACTLY what we wanted, a table tennis surface that fits on top of our dining room table which allows us to play our favourite game whenever we like. I would strongly recommend it. for submitting product review about Viavito Flipit 6ft Table Tennis Top.